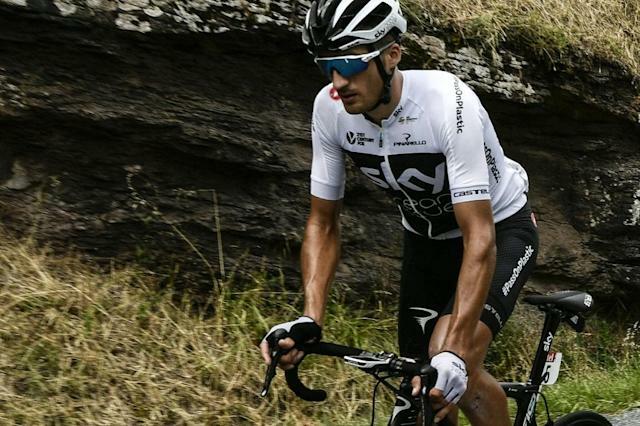 Paris (AFP) - Italy's Gianni Moscon, who was thrown off this year's Tour de France after an altercation with another rider, was banned for five weeks by world cycling's governing body on Wednesday. The Team Sky cyclist, a team-mate of Tour champion Geraint Thomas and four-time winner Chris Froome, was involved in a fracas with Fortuneo's Elie Gesbert during the 15th stage of last month's race. Tour officials said the Italian used heavy-handed tactics when Gesbert tried to help his team leader, Warren Barguil, join an early breakaway in the 181.5km stage from Millau to Carcassonne. "Mr Moscon accepted his responsibility for the incident and will serve a period of suspension of 5 weeks starting from 8 August to 12 September 2018," the International Cycling Union (UCI) said in a statement. Race commissaires classed the incident as a "particularly serious aggression" and threw the 24-year-old Italian off the race shortly after the stage. "I accept the suspension given to me by the UCI. I reacted in the heat of the moment and it was never my intention to hit the rider. As the footage shows I didn't make contact, but I regret my actions and I have already apologised to both Elie Gesbert and Team Fortuneo Samsic for the incident," said Moscon, in quotes posted on Team Sky's website. "This incident obviously happened during one of the most challenging races the team has ever faced," said Team Sky boss Dave Brailsford. "We are confident that Gianni truly regrets his actions and has learnt from this episode. "Gianni is still a relatively young rider at the start of his career and we will continue to give him the help and support he needs to learn, develop and move forward from this." It is not the first time Moscon, now in his third year with Sky, has fallen foul of officials.